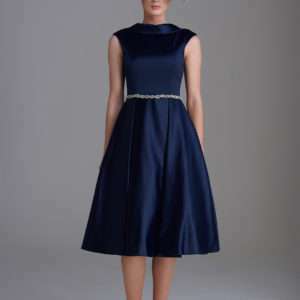 Irresistible IR8111 navy full skirt duchess satin dress. With an air of Audrey Hepburn this exquisite dress is perfect for Mother of the Bride or Groom looking for something special. The dress has a raised neckline that sweeps to an open v at the back. The waist has pretty silver embellishment detail. Irresistible IR8317 winter white tweed dress for mother of the bride, wedding, special occasion. A fabulous stand alone dress with no jacket fuss – but with a jacket illusion. The soft tweed fabric is very tactile and looks beautiful with its golden threads and feminine fringed edges. The dress has an open v neckline and 3/4 sleeve with a modest knee length hem. The dress is fully lined with concealed back zip. Anoola D102 Blush pink brocade bardot collar dress. Glamorous and elegant mother of the bride or groom dress in embossed blush pink brocade fabric for a luxurious feel and look. The dramatic bardot raised collar necklne is the feature of this dress and gives it a sophisticated edge. The dress has a beaded arc waistline that will compliment and flatter most figures along with loose shift straight cut of the dress. Arm coverage is provided by 3/4 sleeve and a modest midi hemline to finish. Stunning, chic and sophisticated mother of the bride or groom dress by Anoola D081 in pale blue brocade fabric. The main feature of this dress is the back, the neckline goes to wide v then gathered by a pretty bow, the back is raised to give modest coverage. The front of the dress is plain and simple straight cut with with wide bardot neckline leading to the fabulous back. Anoola D079 mother of the bride or groom dress with featured ruffle neckline and soft ribbed fabric to flatter the figure. 3/4 sleeves give modest arm coverage and midi length makes this dress an easy to wear choice with style. Stunning mother of the bride or groom dress by Anoola D074 in blush pink and gold fabric with featured raised bardot collar. 3/4 sleeves and midi length with waist detailed by beading and pretty buttons on the back of the collar. John Charles 26391B white gold embroidered dress. Stunning stand alone dress in intricate pretty embroidery flower detailing. The dress has 3/4 sleeves, styled in a simple straight cut and has a golden underlay to add a touch of sparkle. Irresistible IR8102d blue dress with 3/4 sleeves. A soft blue dress with a hue of silver in the lurex fabric gives this dress a soft sheen. The style of the dress is simple shift shape with a loose style skirt and round high neckline. The neckline and the hem of the dress features pretty embellished jewels that add that touch of elegance to this dress. A very stylish and easy to wear mother of the bride or groom outfit, that will have you feeling fabulous whilst comfortable. Anoola Mint Midi Dress with Wide Neckline and Bell Sleeves. This beautiful midi length dress features a wide open neckline and accentuated bell sleeves. The mint green, floral, brocade fabric of this dress is offset against the feature beaded waist detail.